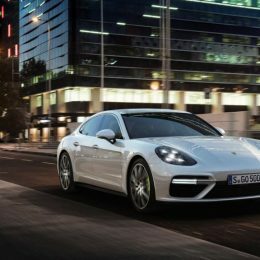 With the 2018 Panamera Turbo S E-Hybrid, Porsche is introducing a plug-in hybrid as the flagship of the model line for the first time. 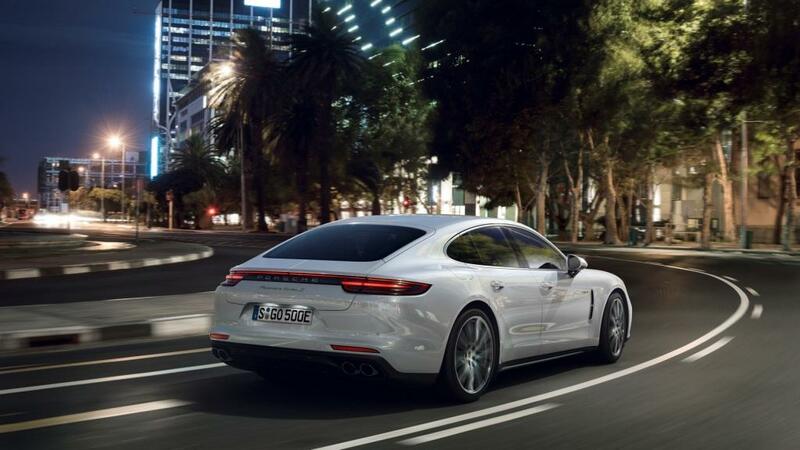 Combining the 4.0-liter V8 engine from the Panamera Turbo with an electric motor, the Panamera Turbo S E-Hybrid delivers a total output of 680 hp and 626 lb.-ft. of torque. Only the limited production 918 Spyder has ever had more power. 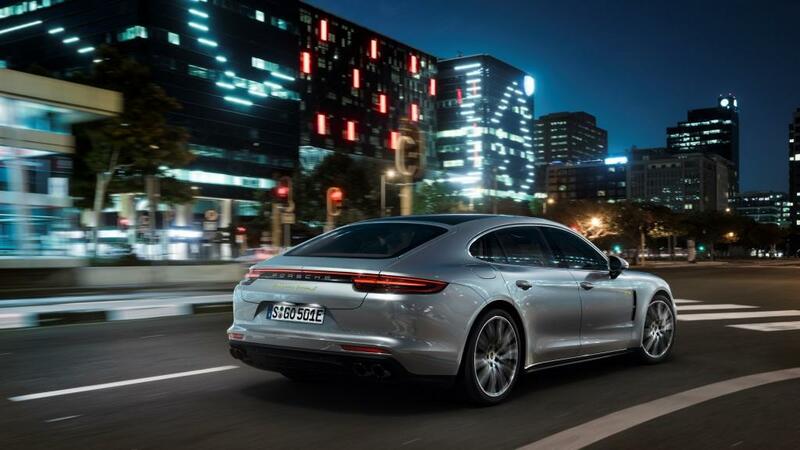 The Panamera Turbo S E-Hybrid accelerates from 0 to 60 mph in 3.2 seconds (3.3 seconds for the Executive model) and has a top track speed of 192 mph. 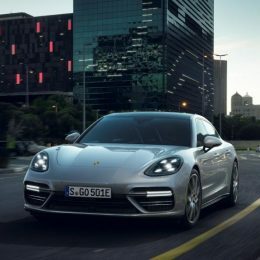 According to the New European Driving Cycle, the average fuel consumption is 2.9 liters per 100 kilometers, and the new top-model Panamera can drive on fully electric power for up to 50 kilometers. EPA-rated fuel economy and range will be available closer to launch. 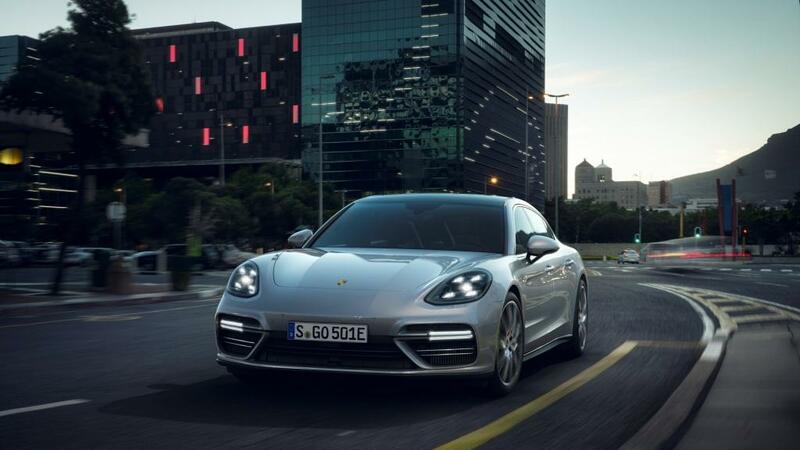 After the successful debut of the Panamera 4 E-Hybrid – which uses a twin-turbo V6 engine combined with an electric motor – the Panamera Turbo S E-Hybrid is another compelling demonstration of the performance advantages of hybrid technology. The new Panamera Turbo S E-Hybrid utilizes a boost strategy derived from the 918 Spyder and combines a 136 hp electric motor with a 550 hp twin-turbo V8 engine. 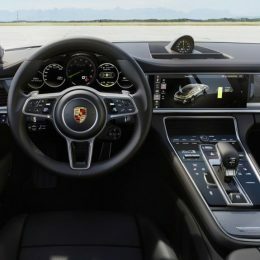 The decoupler installed in the Porsche hybrid module is actuated electromechanically by an electric clutch actuator (ECA), just like in the Panamera 4 E-Hybrid. This ensures quick response and exceptional comfort. 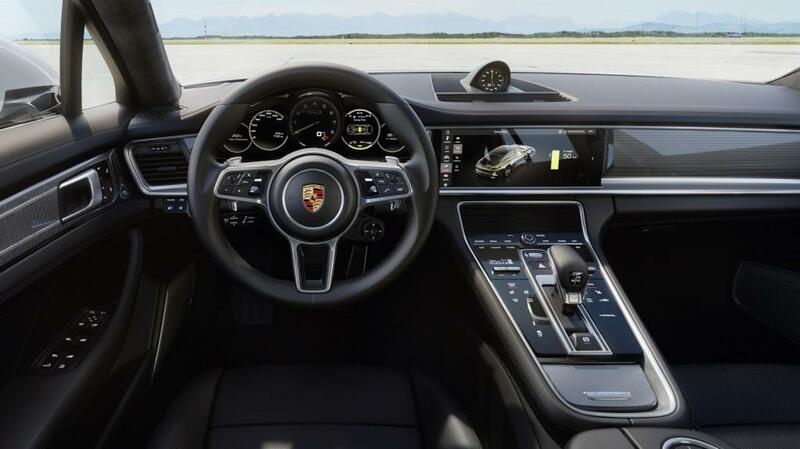 Like other Panamera models, the quick-shifting eight-speed Porsche Doppelkupplung (PDK) dual-clutch transmission sends power to the standard active all-wheel drive system with Porsche Traction Management (PTM). Performance, comfort and efficiency form a perfect three-way combination. 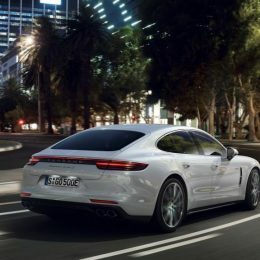 The Panamera Turbo S E-Hybrid comes with air suspension as standard and offers a unique balance in this segment: the comfort of a luxury sedan paired with the performance of a sports car. 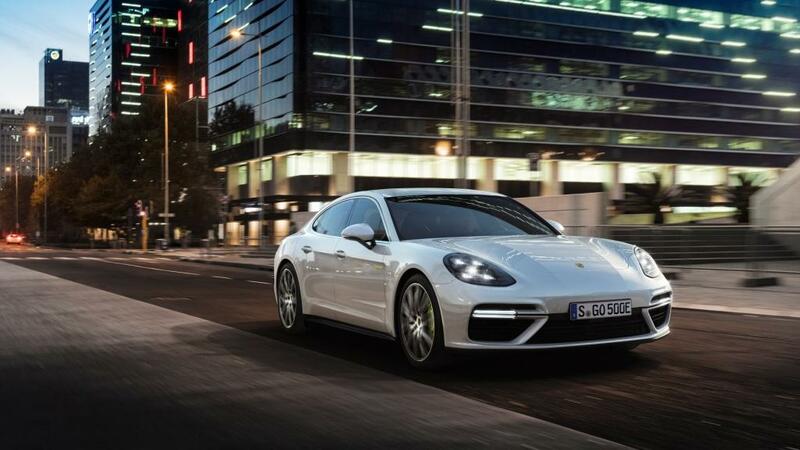 The Panamera Turbo S E-Hybrid starts in the purely electric “E-Power” mode, and is capable of covering up to 50 kilometers on pure electric power according to the New European Driving Cycle (NEDC). 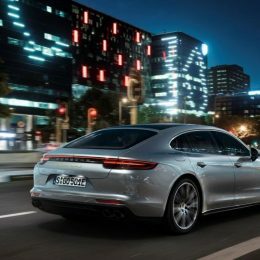 When a specific pressure point on the accelerator pedal is reached, or when the battery charge drops below a minimum level, the Panamera switches to “Hybrid Auto” mode, at which point the total system is available. Consumption in the New European Driving Cycle (NEDC) amounts to 2.9 l/100 km. EPA-rated fuel economy and range will be available closer to launch. Celebrating its world premiere at the Geneva Motor Show (March 7 to 19, 2017), the 2018 Panamera Turbo S E-Hybrid is expected to reach U.S. dealers by the end of 2017. It will also be offered in an Executive version with a 5.9 inch longer wheelbase. Standard equipment on the Panamera Turbo S E-Hybrid includes Porsche Ceramic Composite Brakes (PCCB), Porsche Dynamic Chassis Control Sport (PDCC Sport) including Porsche Torque Vectoring Plus (PTV Plus), Power Steering Plus and Sport Chrono Package. Auxiliary air-conditioning, adaptive aerodynamic elements and a three-chamber air suspension including Porsche Active Suspension Management (PASM) are also standard. The Executive version is additionally equipped with rear axle steering, 8-way power rear seats with comfort head rests, and 4 – zone climate control. Both models are equipped with 21- inch 911 Turbo Design Wheels. The price for the 2018 Panamera Turbo S E-Hybrid will be $184,400, while the Panamera Turbo S E-Hybrid Executive will start at $194,800. These prices exclude the $1,050 delivery, processing and handling fee.